Peace Pagodas are structures associated with Buddhism that are intended to unite people in the search for world peace. Many of them have been built in various countries around the world. 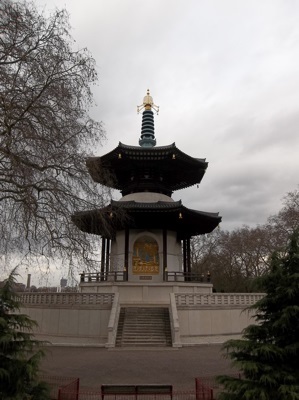 Battersea Park (located on the South bank of the River Thames in London) between Chelsea Bridge and Albert Bridge, is home to one such Peace Pagoda. It was completed in 1985.